Create the purr-fect safe summertime play space for your cat with the Paws Playhouse Cat Run. Stress-free assembly: we provide detailed instructions, all the hardware and now offer a full assembly video. Sturdy construction keeps your kitty in and unwanted visitors out. Spacious in all three dimensions, with heaps of room to play and explore. Inside the secure walls of the Paws Playhouse™, your kitty is free to unleash controlled chaos before settling in the sunshine. With the included accessories your cat will be entertained for hours on end! And there’s plenty of room for you to join in; or just sit back and watch them frolic in their new favourite spot. You could both use a little Vitamin D! You won't need to worry about the safety of your cats any longer when they are inside the Paws Playhouse™. 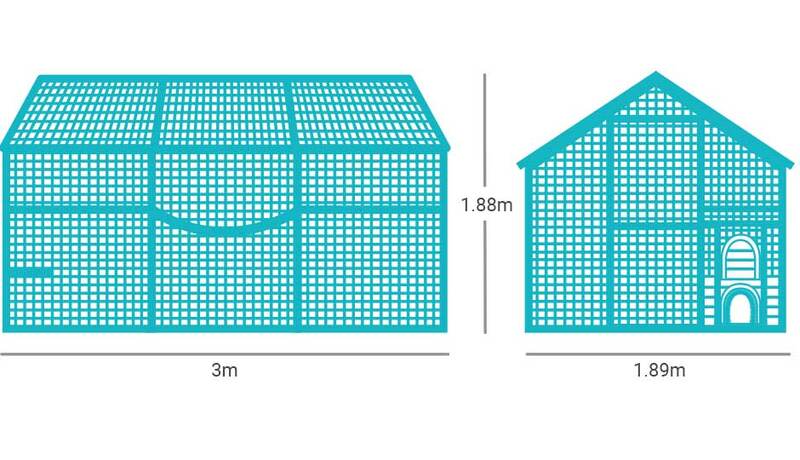 With added safety features like 10 x 10mm galvanised wire mesh & sliding bolt locks on doors to keep your cats safe from snakes and other predators. Every item in the box has been numbered and detailed instructions have been included so assembly of your enclosure is easy and stress free. Download the product brochure to find out all you need to know about this fur-bulous Paws Playhouse™. Full of detailed information, customer enclosures, painting tips & so much more!